Hollywood Signs and Graphics features a wide variety of affordable high quality products and services to make your trade show and exhibit needs a complete success. 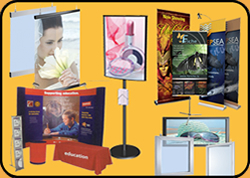 Whether it's one of our several types of banner stands, pop-up displays, or a complete exhibit system, put our expertise and excellent customer service to work for you. To turn pages forward move your mouse over the right edge and click, to go back move your mouse over the left edge and click, or view in fulll screen mode by clicking the page (press Esc button to exit full screen mode).